The CSS group does research on computational argumentation and computational social science. In the past, another focus of members of the group was text mining. Details are given in the following. Notice that much of the described research was done by members of the CSS group before the launch of the group. Also, some of the topics have been led by other people. 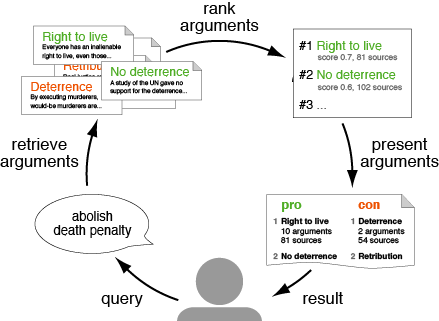 Computational argumentation deals with the computational analysis and synthesis of natural language arguments and argumentation, usually in an empirical data-driven manner. 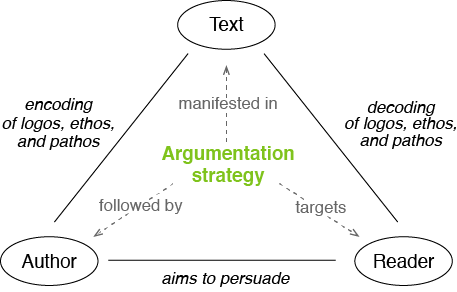 Computational argumentation research that members of the CSS group have particularly contributed to includes the following. Many of its outcomes are or will be demonstrated in the argument search engine args.me. 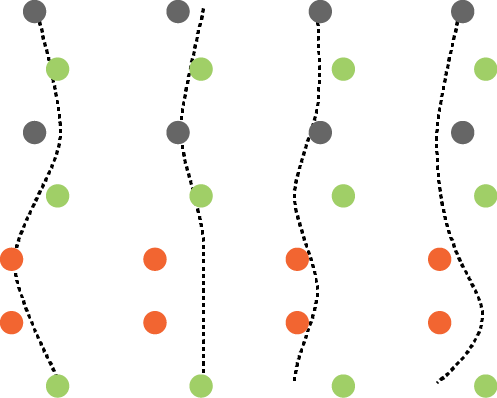 We developed computational models of the sequential flow of review argumentation (COLING 2014) based on an annotated corpus (CICLing 2014). Mapping a text into the feature space of overall structures, flows predict its sentiment robust across domains (EMNLP 2015). Later, we generalized the flow model to other text genres and prediction tasks (ACM TOIT 2017), and we presented a new tree kernel-based approach to capture sequential and hierarchical overall argumentation at the same time (EMNLP 2017b). Based on a news editorial corpus with fine-grained evidence annotations (COLING 2016a), we trained a classifier and used it to find topic-specific evidence patterns (EMNLP 2017a). We modeled and empirically studied the synthesis process of authors following rhetorical strategies (COLING 2018), and we analyzed deliberative strategies in dialogical argumentation on Wikipedia talk pages (ACL 2018a). Starting from a literature survey, we defined a taxonomy of argumentation quality (EACL 2017b), followed by an empirical comparison of theory and practice (ACL 2017). 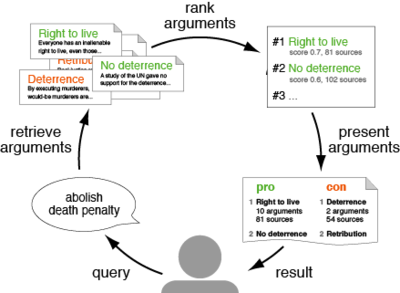 We developed computational approaches to assess specific quality dimensions, such as a machine learning regressor that uses argument mining for argumentation-related essay scoring (COLING 2016b) and a PageRank adaptation for argument relevance (EACL 2017a). With args.me, we introduced the first search engine for arguments on the web (ArgMining 2017b). 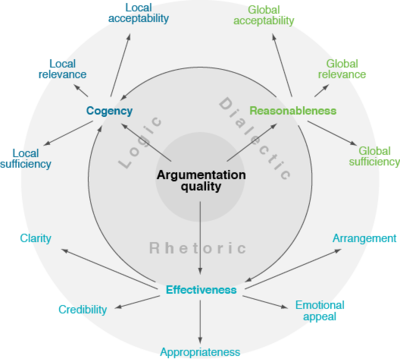 The mentioned assessment of argument relevance (EACL 2017a) may be used for ranking found arguments. Moreover, we developed a computational approach to retrieve counterarguments to arguments based on their simultaneous similarity and dissimilarity (ACL 2018b). Other recent research topics include argument mining (NAACL 2016, ArgMining 2017a), argument reasoning comprehension (NAACL 2018a, SemEval 2018), and ad-hominem fallacies (NAACL 2018b). Computational social science investigates research questions from the social sciences through empirical data analyses. Input data includes social media text, social network structures, online activities, and socio-cultural key indicators. The focus is on insights into social phenomena and dynamics rather than the technologies behind. In the context of the research program Digital Future, the CSS group is doing computational social science research on the following topics. Crowdworking is one phenomenon of the digitilization of the society. A particular challenge in many crowdworking processes is an effective and reasonable communication between requesters and workers. We are analyzing typical, good, and bad communication in this context, in order to then develop technological ways to improve the communication. More details follow soon. For many controversial topics in life and politics, people disagree on what is the right stance towards them, be it the need for feminism, the influence of religion, or the assassination of dictators. 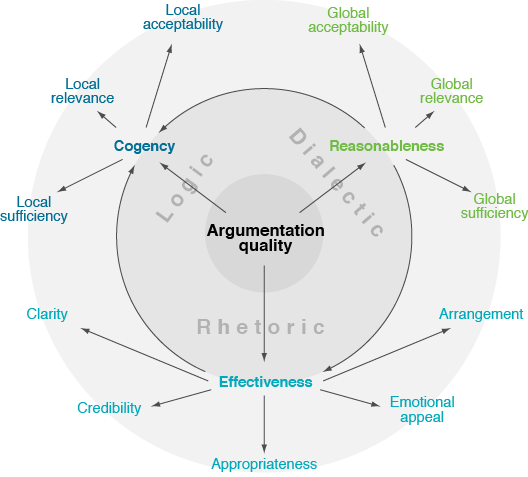 Stance is affected by the subjective assessment and weighting of pro and con arguments on the diverse aspects of a topic. Building stance in a self-determined manner is getting harder and harder in times of fake news and alternative facts, due to the unclear reliability of many sources and their bias in stance and covered aspects. We are analyzing how a self-determined opinion formation can be supported through technologies such as the argument search engine args.me. More details follow soon. Text mining deals with the automatic or semi-automatic discovery of new, previously unknown information of high quality from large numbers of unstructured texts. 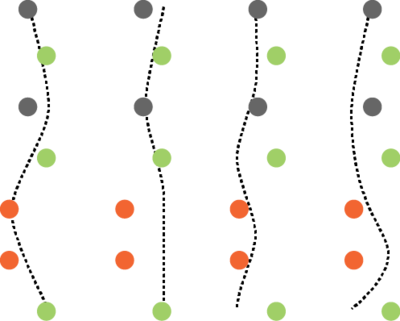 The types of information to be inferred from the texts are usually specified beforehand, i.e., text mining tackles given tasks. Text mining research that members of the CSS group have particularly contributed to includes the following. We have developed a method that creates a text analysis pipeline ad-hoc in near-zero time for a specified information need along with a quality prioritization using partial order planning and greedy-best first search (CICLing 2013). In addition, we can automatically equip any such pipeline with an assumption-based truth maintenance system that systematically ensures that each algorithm in a pipeline analyzes only potentially relevant portions of text (CIKM 2013). 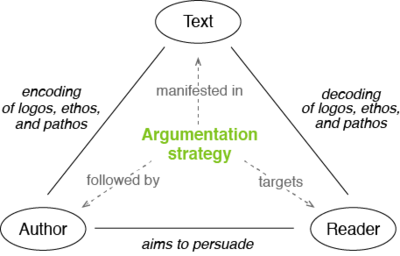 We developed a process to optimize the run-time efficiency of any text analysis pipeline (CIKM 2011). Based on the assumption-based truth maintenance system mentioned above, we found the theoretically optimal pipeline schedule using dynamic programming (COLING 2012). It depends on the run-time and found information of each employed text analysis algorithm. These values are not known beforehand, which is why an informed best-first search scheduling approach is more preferable in practice (LNCS 9383). In case the input texts to be process are heterogenous, an adaptive scheduling is needed, which we have realized with self-supervised online learning (IJCNLP 2013).